I got my three free Zoya's today! They're beautiful. I ordered Ivanka, Adina, and Luna. I went with Luna first because it seemed to match the snowy weather. 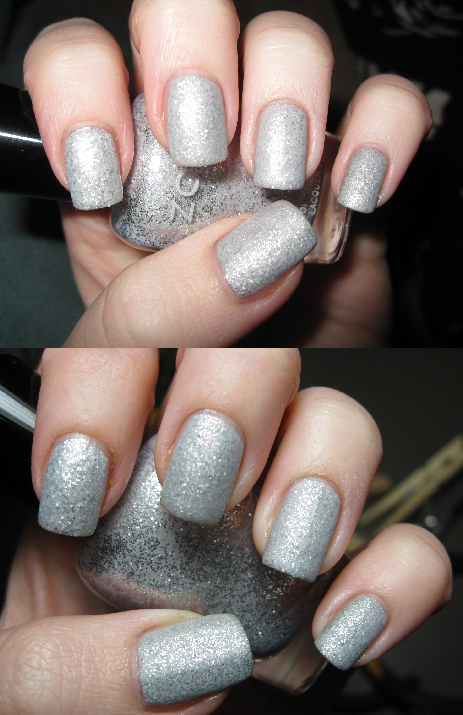 Luna is a milky, dove grey base packed with silver glitter. This is two coats over a thin coat of silver polish. It went on very smooth, like all other Zoya's I've tried, and dries slightly matte. I topped it of with a coat of Essie's Matte About You, and I LOVE it! I think it looks amazing mattified, very.. robot-y. Like metal. I bought this because I thought it'd look great matte, and I was right! I hope it wears well. Luna isn't my style but it sure is a beautiful color! I also ordered Ivanka and can't wait to see it on your nails.